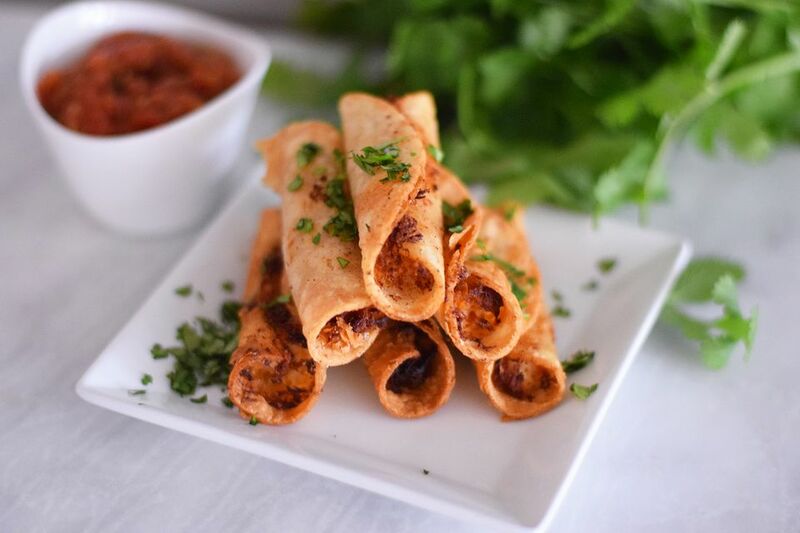 ​These tiny chicken taquitos have huge spicy chipotle and garlic flavor. The filling is creamy, cheesy, and irresistible. You won't be able to stop eating them and neither will your guests. They are the perfect party appetizer, because you can make them ahead of time and freeze them. Simply bake them in the oven until they are crisp when you are ready to serve. They go along great with other Mexican appetizers like mini Mexican pizzas, guacamole, or your very own DIY Nacho Bar. In a small food processor or blender (or finely chop on your own) combine the chipotle pepper, lime juice, olive oil, salt, pepper, cumin, Sazon seasoning, and garlic until completely smooth. Place the chicken breasts in a medium-sized bowl or plastic ziplock bag. Pour the marinade over the chicken and place it in the refrigerator for at least 30 minutes, or up to 4 hours. Add the marinated chicken, including the marinade, to a medium-sized, heavy-bottomed pot. Pour the chicken broth over the chicken. Cover the pot with a lid and heat on the stove on medium heat. Simmer for 10 to 15 minutes or until the chicken is cooked through. Remove the lid and turn the heat to high. Allow the liquid to reduce to half. Transfer the chicken to a large bowl and allow to come to room temperature. It can be placed in the refrigerator to speed up this process. Shred the chicken. Add the cream cheese, sugar, and shredded cheese to the chicken mixture and stir to completely combine. Cut the tortillas into smaller rounds using a biscuit cutter or by cutting around the edge of a glass. Reserve the scraps for another recipe, like breakfast migas. Heat the frying oil to 375 F in a large heavy-bottomed pot. Dip the corn tortillas in the oil and quickly remove them. Place them on a paper towel-lined plate to drain. This step helps the corn tortillas to be more flexible and easier to roll. Place about a tablespoon of the chicken mixture onto the center of each tortilla round. Roll the tortilla around the filling. Pick the rolled tortilla up with tongs, securing the seam facing down with the tongs. Hold the tongs and tortilla under the oil until it is fried enough to stay closed. Release and allow to cook for another 2 minutes or until lightly browned and crisp. Remove them from the oil and place them on a paper towel lined pan or plate. Repeat with the remaining taquitos. You can fry 5 to 6 taquitos at one time after holding each under the oil with tongs. Serve the taquitos with sour cream and salsa. You can also freeze them and bake them at 375 F for 10 minutes until cooked through and crisp.